A picture is worth a thousand words….. And wedding photos are a big deal. There was a time when wedding photography was all about the bride and groom going to a studio to get their portraits done. The technology available and basic lighting techniques didn’t allow photographers to do more. As photographic techniques and technology are constantly advancing ahead, right now we can talk about so many different approaches. So before anyone starts the tricky task of choosing the right photographer for your wedding, one thing you have to consider is the wedding photography style. There are different wedding photography styles, but the most common styles are traditional and photojournalistic. Take a look at the numerous photography sites and blogs found on the internet, and a few words that constantly pop out are photojournalistic and traditional. While similarities exist between traditional and photojournalistic approaches – both use the same equipment – what makes a significant difference is the technique and approach. In a nutshell, traditional style is portrait oriented and the photojournalistic approach is capturing a moment as it happens. Let’s take a look at both these approaches to bring you closer to choosing the perfect wedding photographer. Traditional wedding photography concentrates more on posed portraits with careful compositions, off-camera lighting and the use of artistic backgrounds. Here the photographer is also a coordinator who assists in guiding and directing the wedding. The photographer may seem a bit intrusive, but the images produced from traditional photography are beautiful and tend to have a classical aspect. It has a more photo-shoot approach with precise control, pre-planned ideas and artificially set-up images. For example, the traditional wedding photographer will make sure that the bride and groom look perfect throughout the day, right from the bridal preparations to the ceremony till the reception. He may constantly seek to get their attention approaching them on regular intervals asking them to ‘look here’ or ‘smile please’. The photographs may seem a bit common and repetitive. On the other hand, a photojournalistic approach enables the photographer to naturally capture a story as it unfolds before them. The photos show the essence and the mood of the wedding day in the most natural and authentic way. Here the involvement of the photographer is quite minimal and everything is captured at the moment and in reality. The beauty of this style of photography is that you end up with a piece that is unique to your wedding by avoiding the perfected cliché styled shots. 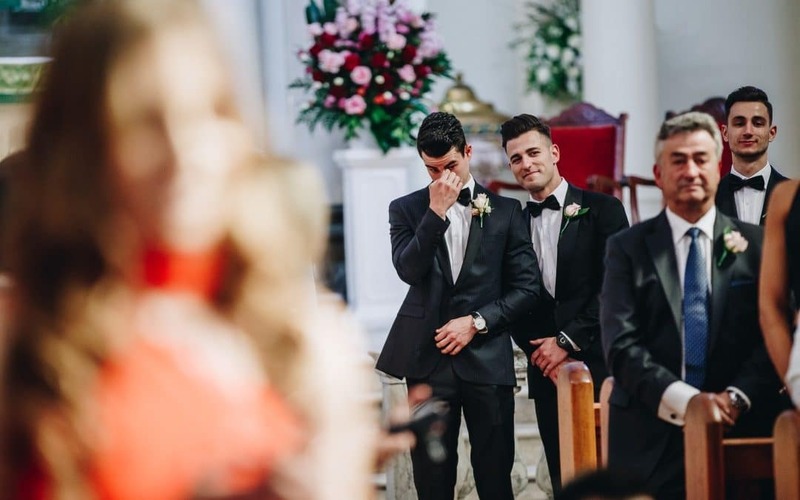 For example, the photographer here captures those rare moments that would otherwise be unnoticed or forgotten – an emotional moment between the father and the bride, a wedding shoe simply lying on the floor – those pictures that seem like a story displaying emotions. An experienced photojournalistic photographer will add a unique vision based on his creativity. So how do you want your wedding album to look when you consider hiring a Sydney wedding photographer? Do you want a wedding album that looks more like a storybook or a series of posed portraits? You do not mind spending a lot of time posing. You do not mind your photographer being intrusive and the director of your wedding. You like the look of glamour looking pictures in your album. You love candid images of you and your guests. You hate posing and staged portraits. You detest albums full of posed shots which don’t really impact the feeling of a wedding. You want to capture the mood, ambiance, and feel of the wedding day as it happens. Or you could take the middle path with a mixture of photographs capturing the spontaneous moments as well as a few posed photographs of the couple with their families and friends. The best way is to choose a photographer who recognizes the value of certain aspects of traditional photography and at the same time can capture those emotional and spontaneous moments effectively.